One of the most catastrophic results of medical malpractice can be amputations. If a patient is improperly or negligently treated for diabetes or infection of an upper or lower extremity, often amputation of a limb can result. The overall effect that amputation can have on a person can be devastating. Symptoms of necrosis must be carefully monitored by the hospital or physician in order to avoid such disastrous consequences. Raging infection must be controlled to avoid an amputation. In any case, an experienced medical malpractice lawyer can assist you in your claim for an injury as severe as an amputation. In some instances, injured persons have to face the possibility of amputation. Amputation is when a body extremity is removed either by trauma or surgery. A surgeon removes a limb, or part of a limb, that is no longer useful or causes great pain due to a serious infection, necrosis or life threatening disease. Amputations are usually an operation of last resort and are most often performed on the toe, foot, arm, or leg. Surgical amputations have occurred for over 2000 years. Although amputations are sometimes needed for reasons such as serious injury or presence of a tumor in the limb, the most frequent reason is peripheral arterial disease (PAD) which is due to atherosclerosis, or hardening of the arteries. Thirty to forty percent of amputations are performed in patients with diabetes. Because the body’s cells depend on a constant supply of oxygen and nutrients delivered by the blood, the cells and tissues die and are vulnerable to infection if the blood vessels are unable to supply oxygen to the fingers and toes. Sometimes doctors refer to this as “gangrene” which is when the body tissues become black and start to decay. If the blood supply can not be improved or the tissue damage can not be repaired, amputation is required in order to stop the infection from getting worse and to stop the pain. PAD is the top cause of amputation in people 50 years old and older, and represents for 80-90% of amputations in total. The Agency for Healthcare Research and Quality states that about 1.9 million people in the United States are living with an amputation. Another case that might require amputation is when someone is in a serious car accident (or motorcycle accident) and suffers a horrible injury. Also, when someone is in a fire and suffers severe burns on certain parts of the body, a limb might need to be amputated. Doctors make every effort to save the damaged blood vessels or use donor tissues. However, if the damage can not be repaired, then the infection has the potential to spread throughout the body and amputation is necessary to save a life. Traumatic injuries are the leading cause of amputations in people under 50 years old. One special case is congenital limb deficiency which is when an infant is born without part or all of a limb. Elderly patients face more risk and complications than younger patients when undergoing amputation. Recovery time for older patients is longer, and the biggest risk an elderly person takes if having a limb amputated is the risk of death. Therefore, amputation is only performed if it is absolutely necessary. Other complications include chest infections, angina, heart attacks, and strokes. Pressure sores and wound sores are other possible complications, as well as deep venous thrombosis. The symptoms that a doctor might check for to determine if a limb can be saved are the following: fever, cool skin near your wound, extremely painful skin, wound odor, infected or non-healing sores or wounds. A doctor might also perform tests to see how well your blood is reaching your limbs, such as blood pressure tests, ultrasound, or angiography. Sometimes a CAT scan (computed tomography) or MRI (magnetic resonance imaging) is used. During amputation, the surgeon will remove the diseased limb while trying to preserve as much healthy skin, blood vessels, and nerve tissue as possible. The anesthesiologist will numb parts of the body with either a general or regional anesthetic. Heart rate, blood pressure, temperature and brain function will be monitored by machines during the surgery. Once the patient does not feel any pain and the anesthetic has started to work, the doctor makes an incision into the skin. Not only will the doctor leave enough healthy skin to cover the stump for better healing, but he or she will also reshape the muscles near the incision site to make sure that the stump has a comfortable contour for an artificial limb. The doctor also divides and protects the nerves so that they are not exposed and painful. During surgery the major blood vessels are clamped to minimize the bleeding, and then the doctor stitches the blood vessels before finishing the amputation. If the patient has a traumatic injury, the doctor will remove any crushed bone fragments and damaged tissue. Then, the doctor will smooth the uneven areas of the bone to prevent pain once the patient receives the artificial limb. Not all people use artificial limbs. The doctor and the patient decide together if an artificial limb is necessary and helpful for a patient’s recovery. A lot of times, a patient is measured for the device before the operation so that it is ready as soon as the recovery process starts. However, some doctors like to wait until the incision is healed completely before the patient gets the artificial limb.) The doctor may place a stocking over the stump to hold wound dressings or drainage tubes. 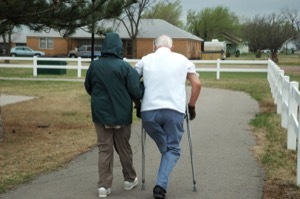 The limb might be placed in traction or a splint depending on the situation. After surgery, the patient should be able to leave the hospital within one to two weeks. During recovery at the hospital, the doctor or nurse will help the patient change the wound dressings, and monitor vital signs or any other medical conditions. The doctor will prescribe pain medications if necessary. The wound should be fully healed within four to eight weeks after surgery. Usually the patient will receive physical therapy soon after surgery, which includes gentle stretching and getting in and out of your bed and wheelchair. Eventually, the patient will learn how to bear weight on the remaining limb if the lower extremity is involved or will learn how to use only one hand or arm if the upper extremity is involved. Patients who receive artificial limbs might be ready to practice with them as soon as 2-3 weeks after surgery, depending on the situation. Not only do patients experience physical pain at the surgery site, they also might have some emotional pain in thinking about the loss of a limb. If this happens, the patient needs to talk to the treating physician and perhaps obtain a referral to a psychiatrist experienced in counseling amputees. As in all medical conditions, it is important to eat a healthy diet, exercise regularly, and avoid smoking. Some studies have demonstrated that amputees who engage in regular physical exercise feel much better about themselves than those who are less active. Also, some studies suggest that people who recover satisfactorily from an amputation are more likely to have greater job satisfaction because of acceptable modifications in their attitudes and goals. As difficult as it is to do because of the physical and emotional components involved in any amputation, if an amputee retains a positive attitude about life, their overall well being is improved as well. There is also a phenomenon known as phantom pain that amputees suffer from when losing a limb. The patient actually feels pain from the missing limb even though it is no longer there. This is particularly disconcerting to the patient because it is a constant reminder of the missing limb, as if any reminder is needed regardless. Often amputations result from another person’s negligence, either from serious trauma or medical negligence. If that occurs, the lawyers at the Law Firm of Foran & Foran, P.A. are ready, willing and able to assist in obtaining a fair recovery.